Students will be able to understand the meaning and purpose for reciting the Pledge of Allegiance. Ask students to recite the Pledge of Allegiance. Next, ask students what grade they started saying the Pledge of Allegiance in. Ask students why they think they recite the Pledge of Allegiance everyday. Record student responses on the board. After hearing student responses, show the video The Pledge of Allegiance. After students view the video on the Pledge of Allegiance, ask students to review their answers for why they think we say the Pledge of Allegiance. Give students an opportunity to share out and record student responses. Have students compare their new responses to their initial thoughts. 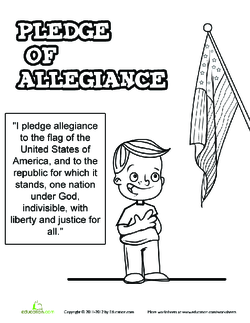 Next, pass out the Pledge of Allegiance coloring worksheet to each student. While modeling to students, ask students to highlight the key terms pledge, allegiance, republic, indivisible, liberty, and justice. Tell students that in order to better understand the Pledge of Allegiance, the highlighted terms will be replaced with new vocabulary. Ask students to look at the first highlighted word pledge. Tell students that PledgeMeans to promise, and write the word "promise" above pledge. Continue replacing each highlighted word with a new one while discussing its meaning. In the end, you should have Allegiance, love or devotion, Republic, people, Indivisible, not divided, Liberty, freedom, and Justice, fairness. 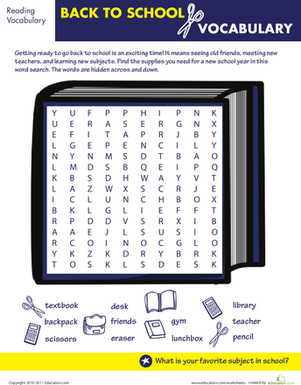 Ask for student volunteers to read aloud the pledge using the new terms. Remind students that even though the words are different, the meaning remains the same. Allow time for students to colour their picture. Next, pass out the handout titled, The Pledge of Allegiance to each student. 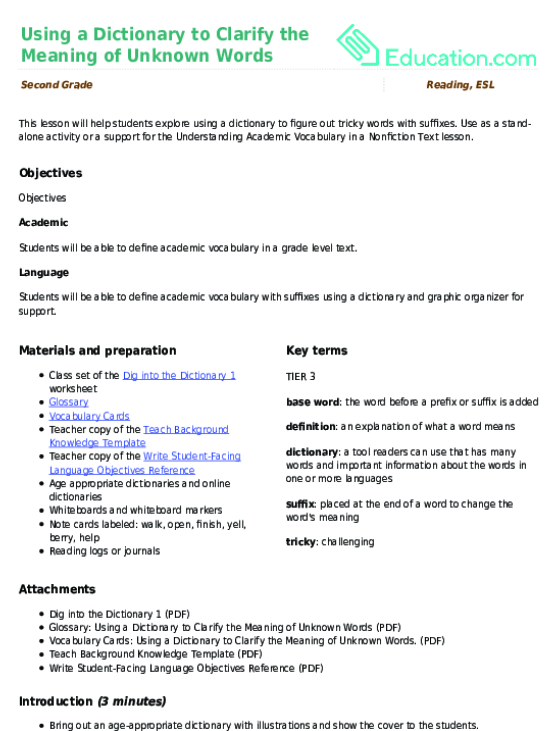 Tell students that this class assignment will help them identify key vocabulary in the pledge. Before beginning, review the directions with the class. Enrichment:For students who need an extra challenge, ask them to write in their own words for the meaning of the Pledge of Allegiance. Ask students to present their thoughts to the class. Support:For students needing support, have them highlight only three words, and complete both worksheets in a smaller group setting with teacher support. To check for understanding, monitor the classroom as students are working independently. 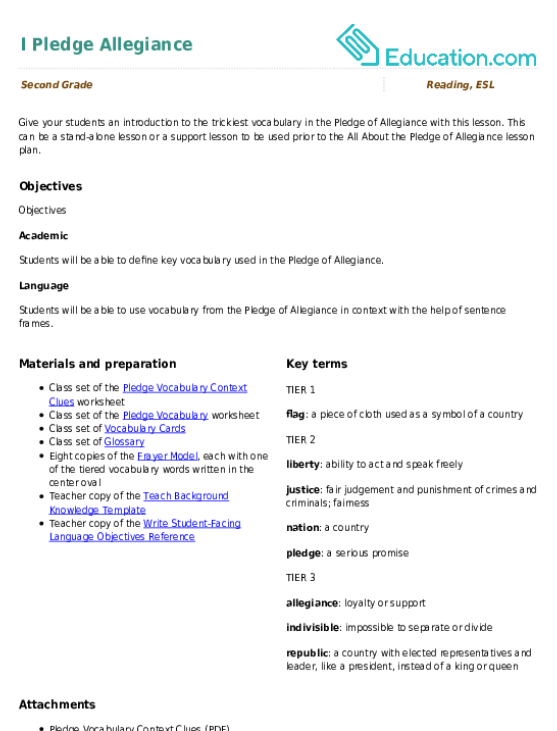 Check for correctness on The Pledge of Allegiance handout. 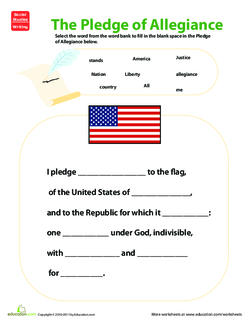 At the end of the lesson, correct The Pledge of Allegiance handout as a whole group. As a homework assignment, ask students to share what they learned and the meaning of the Pledge of Allegiance to a family member. The Pledge of Allegiance has been recited for years, but how many truly know its meaning? This can be a stand-alone lesson or a support lesson to be used prior to the All About the Pledge of Allegiance lesson plan. Your students will use context clues and a word bank to reinforce their understanding of the vocabulary found in the Pledge of Allegiance. Your students will use an abridged version of "The Princess and the Pea" to practise analyzing and expressing character traits with the help of a word bank. 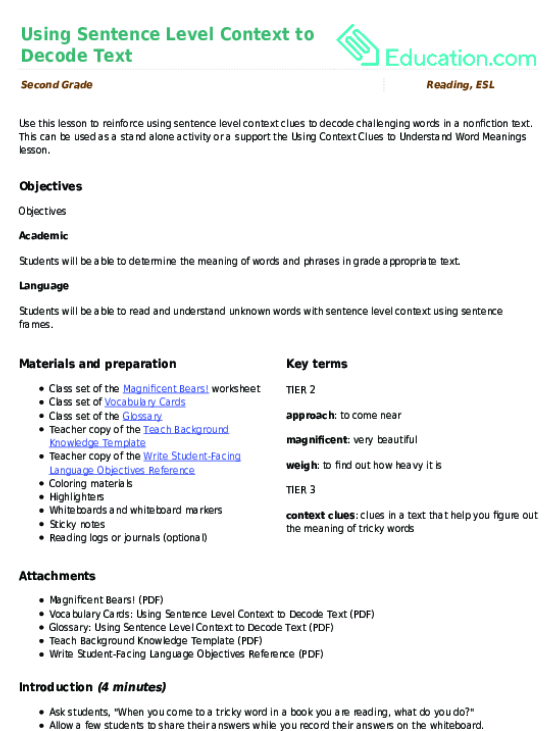 This can be used as a stand alone activity or a support the Using Context Clues to Understand Word Meanings lesson.